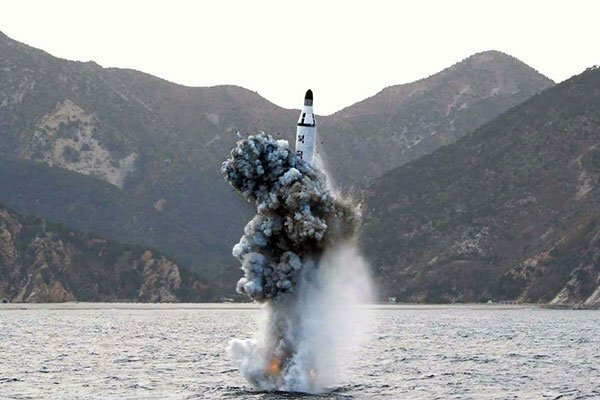 South Korea launched its first ever missile-capable attack submarine on Friday, despite a recent diplomatic thaw with the nuclear-armed North. The $700 million, 3,000-tonne Dosan Ahn Chang-ho submarine is capable of firing both cruise and ballistic missiles and the first of three planned diesel-electric boats to go into service in the next five years. It represented a “leap forward in the country´s” defence industry, President Moon Jae-in told a launch ceremony at the Daewoo shipyard where it was designed and built. Moon will head to Pyongyang next week for a third summit with the North’s leader Kim Jong Un, as US-led efforts to persuade Pyongyang to give up its nuclear weapons have stalled. “We have set off on a grand journey toward the denuclearisation of the Korean peninsula,” Moon said. “But peace is not given gratuitously,” he added. The new submarine is fitted with six vertical launch tubes and features indigenous sonar and combat management systems. Aside from the new vessels, South Korea has an existing fleet of 18 smaller submarines, all built in co-operation with Germany. According to the defence ministry, the North has 70 ageing submarines and submersibles, and Yonhap news agency reported that it has also developed a new 2,500-tonne submarine fitted with a vertical launch system.